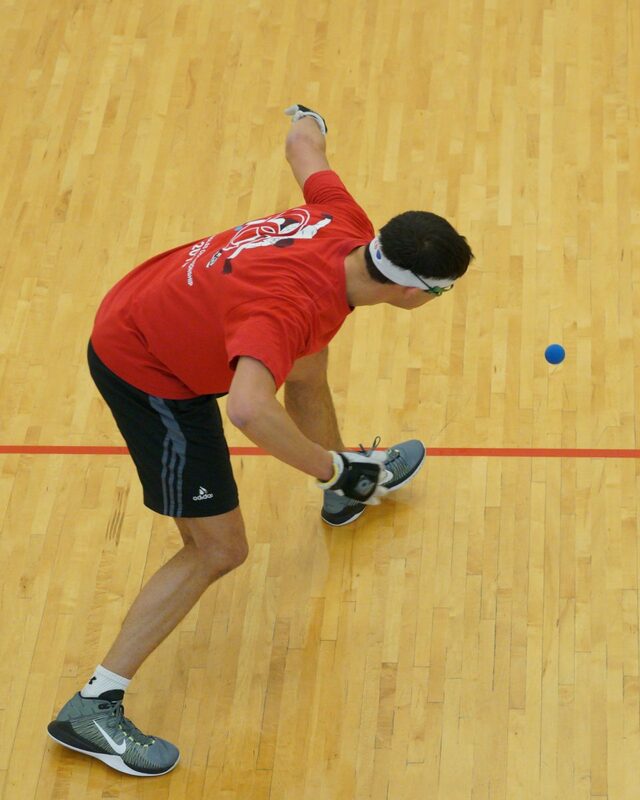 Houston, TX, WPH Press, 3/5/17- The World Players of Handball and the Houston Handball Club featured the finals of the fifth stop of the Race 4 Eight season from Houston, as the Race 4 Eight superstars continued their quests for Race 4 Eight crystal and jockeyed for the top spot in the Race 4 Eight Power Rankings. Houston’s final pitted 10-time Race 4 Eight champion and 2012-2014 R48 #1 Luis Moreno against current the WPH R48 Player’s Champion and two-time R48 champion Killian Carroll. Carroll won two of the pair’s three R48 match-ups entering Sunday’s final, and a third win against Moreno in Houston would rocket Carroll into the R48 #1 ranking for the first time. Killian Carroll was sensational in the final, combining speed, power, consistency, anticipation, and impeccable concentration to dismantle Moreno. Moreno played even with Carroll for the first 11 points of the match, leading 6-5 before Carroll found another gear. Carroll unleashed his full arsenal of two-handed offense and defense to thwart Moreno’s momentum and completely take control of the match. 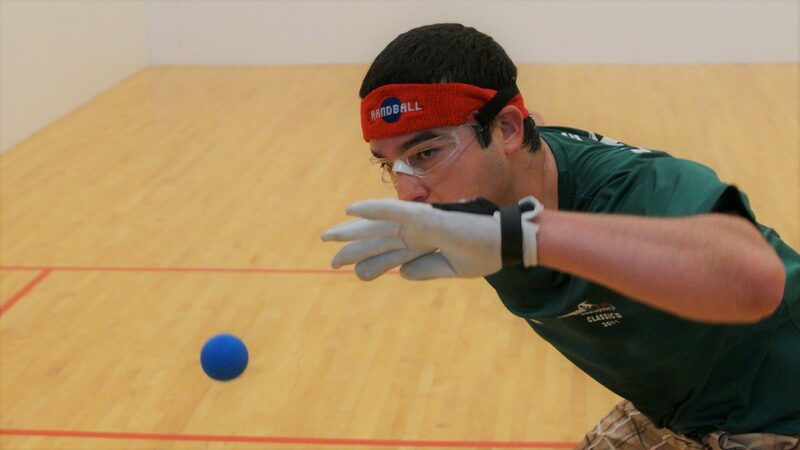 Carroll scored 10 of the last 11 points of the first game and continued his quest towards the R48 #1 ranking in game two, making just two errors against 15 kills to win his second consecutive R48 start. 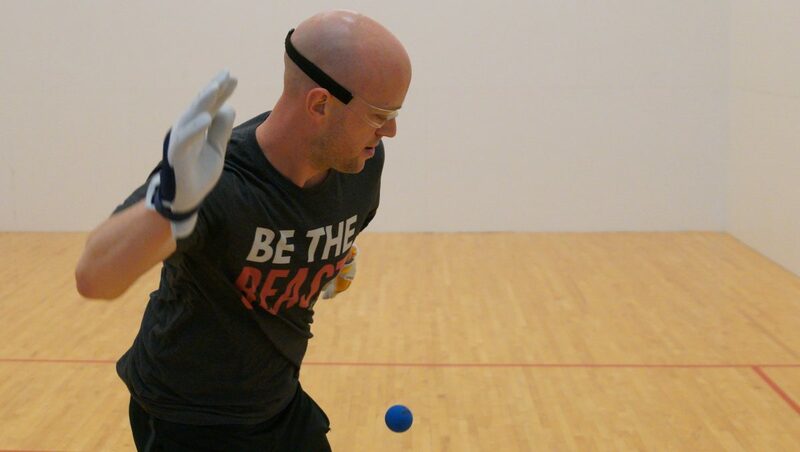 Important R48 ranking points were on the line in Huston, as playoff matches determined ranking positions for R48 pros jockeying for Elite 8 status heading into the R48 6 NYAC in three weeks. 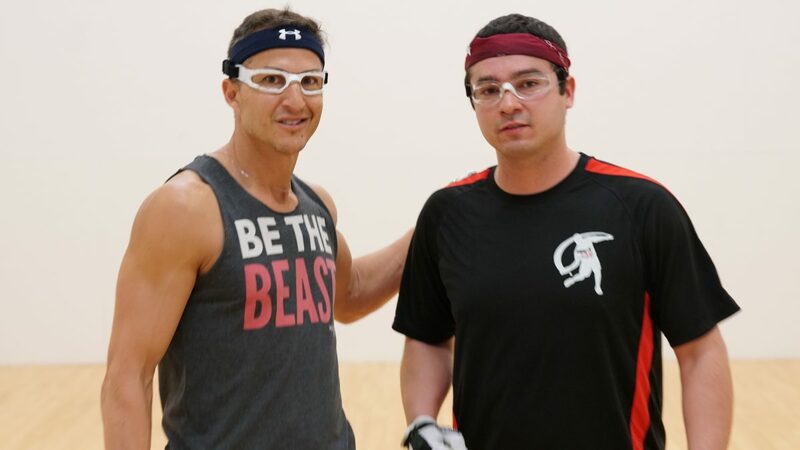 The greatest brothers tandem in professional handball met for the fifth time in R48 play, with older brother Luis winning three of the four encounters with his younger brother Daniel entering Houston’s 5th place final. Although being one another’s greatest supporters, the brothers are fiercely competitive against one another on the court. The Cordovas ran one anther all over the court in a high-paced, frenetic match that featured an average rally length of nine shots. Daniel started quickly, racing to a 5-0 lead but was quickly caught and overtaken by his older brother. 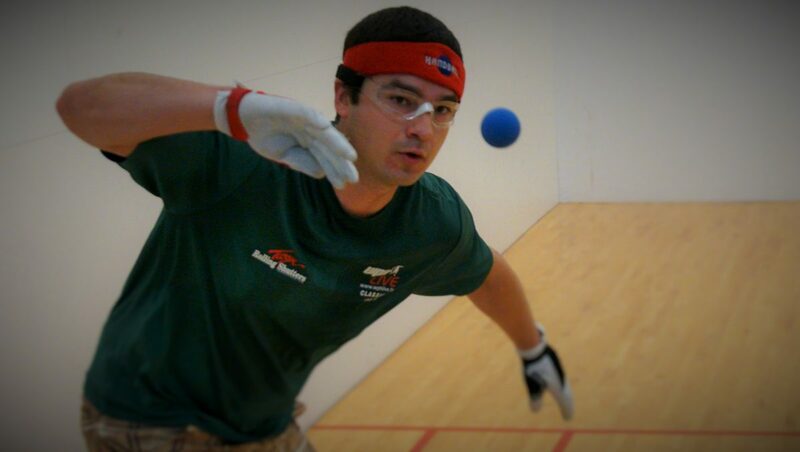 Luis eventually led 21-12 but was unable to finish a rally with Daniel pinned against the front wall. Daniel scored four consecutive points but missed an easy fly kill at 16-21 and never scored again. Mando Ortiz shook off a first round Houston loss to Marcos Chavez to advance to the 9th place final with victories against Loren Collado and Andy Nett, while Ortiz’s LAAC teammate and newly minted Elite 8’er Vic Perez overcame Shorty Ruiz and Adam Bernhard en route to the final. Despite never being ranked ahead of Ortiz, Perez owned a 2-1 R48 record against Mando, including a tiebreaker win in their last encounter in the quarterfinals of the R48 6 Plummer Bash in January. Austin’s Memo Pallares faced Minnesota’s Ryan Pesch in the deepest 17th place draw in R48 history, featuring four former or current R48 pros and a number of R48 future pros. Pallares and Pesch were both playing in their seventh matches in two days in Houston’s 17thplace final, demonstrating their extraordinary passion for the game and endless energy. Pallares overcame the Minnesota attorney in a close battle, climbing back onto the R48 Power Rankings after dropping off last month. 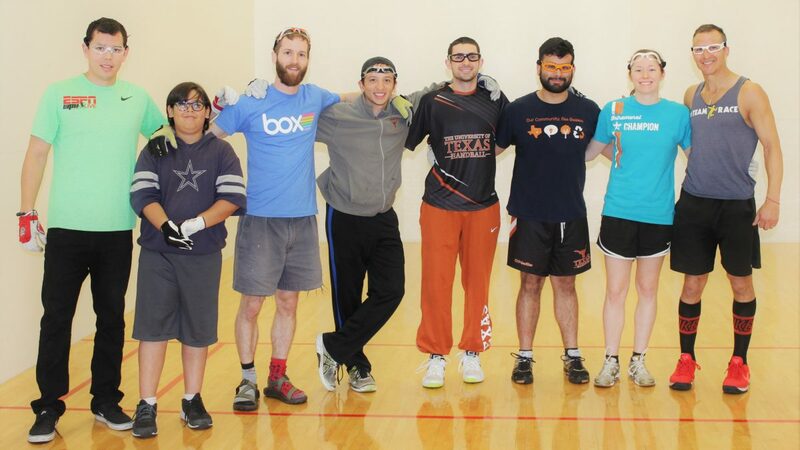 JR WPH was thrilled to coach a collegiate clinic for the University of Texas handball team, with WPH Coaches David Fink and Luis Cordova leading the enthusiastic collegiate handball players in an instructional clinic focusing on strong-hand offense and footwork. Following demonstrations by R48 top 10 star Luis Cordova, each participant was given the opportunity to hit shots under the watchful eyes of Coach Fink and Coach Cordova. Thank you to Houston tournament directors Ron Cole and Jerry Garcia for another outstanding Houston R48 6 and Texas State Championships. 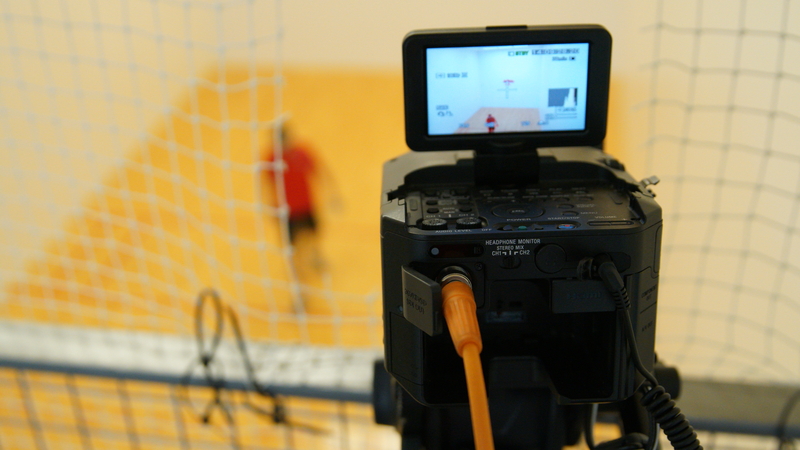 Thank you to the entire Houston Handball Club for rolling out the red carpet for the pros, players, and fans throughout the weekend. 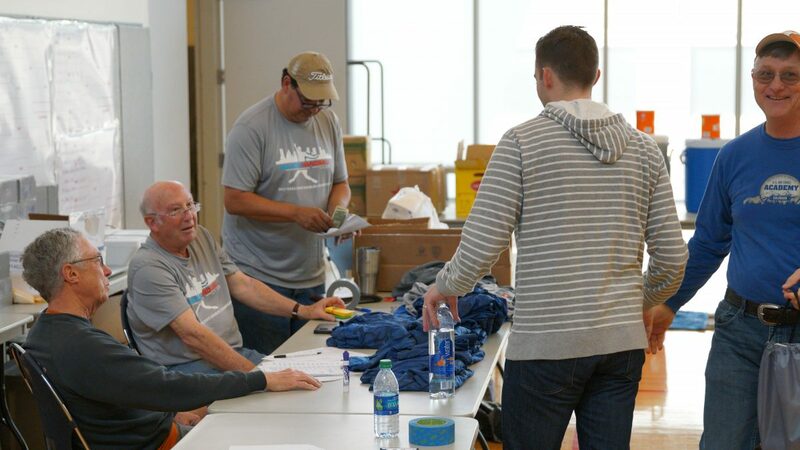 Thank you also to the entire WPH staff and film crew for their tireless efforts in bringing the 2017 R48 Houston to hundreds of thousands of homes across the world. 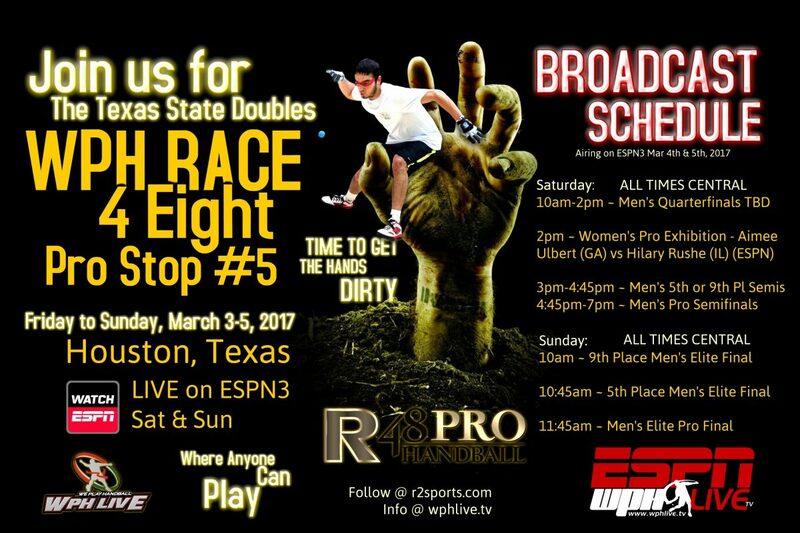 Catch the Race 4 Eight 6 Stop #6 NYAC March 23rd-26th with weekend coverage on ESPN3. 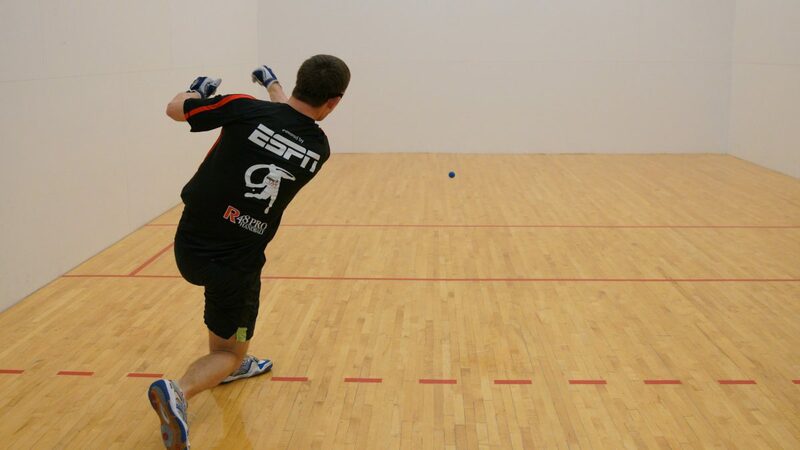 Watch replays from the Houston R48 6 Stop #5, go to the ESPN App (here), as the WPH continues its electrifying handball coverage for the third consecutive season on the Worldwide Leader in Sports. 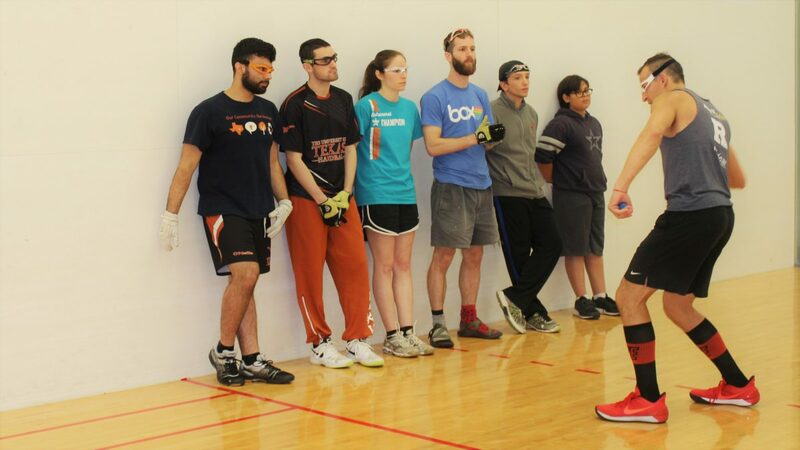 Houston, TX, WPH Press, 3/4/17- The World Players of Handball and the Houston Handball Club featured compelling quarterfinal matchups and the “Saturday Night Primetime” handball semifinals at the WPH Race 4 Eight 6 Stop #5 & Texas State Doubles Championships on Saturday. David Fink and Daniel Cordova met for the second time this season, with Cordova winning the first encounter at the Simple Green U.S. Open. Fink started fast in game one, building a 5-0 lead before Cordova tied the score at eight. The pair exchanged kills and great retrieves all the way to 12-12, with Fink breaking away to clinch game one with three straight points. Cordova caught fire in game two, building a 14-3 lead behind serve-and-shoot clinic that never allowed Fink to climb into a rally. Fink scored six consecutive points to pull within five, but Cordova slammed the door to force a tiebreaker. 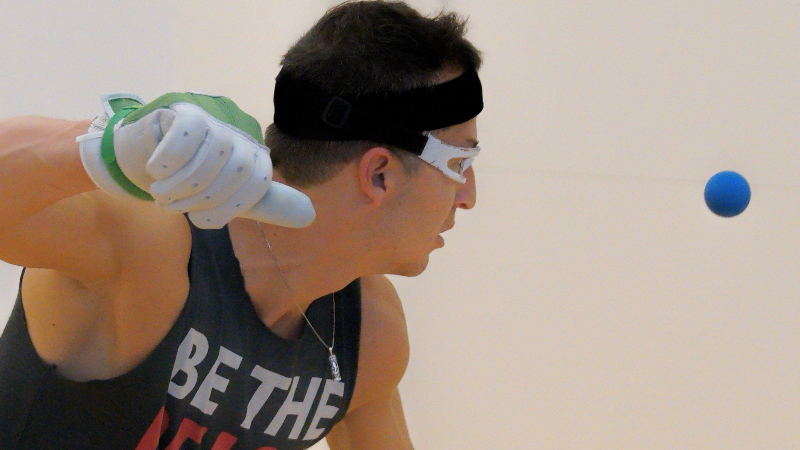 Fink entered the zone in the tiebreaker, killing the ball from everywhere on the court en route to a 9-2 lead. The pair played virtually even for the remainder of the tiebreaker, with Fink winning his third consecutive R48 quarterfinal tiebreaker. Luis Moreno had little difficulty overcoming Marcos Chavez, extending his head-to-head record to 4-0 against the SR48 #1 in Race play in just 13 minutes. Killian Carroll met Luis Cordova for the second time in Race play, with their second encounter playing out much like their first. Cordova led 8-6 midway through game one with great offense, but Carroll turned the tide, scoring 24 of the final 28 points of the match. “As soon as my energy dropped just five percent, I couldn’t win points,” lamented Cordova. Luis Moreno and David Fink split their first two encounters thus far in the R48, with their Houston semifinal serving as the rubber match. Fink started well, building a 9-5 lead with a great serve and first-strike kill, but Moreno turned the tables, finding his serve and deep court kill game to dominate the remainder of the game. 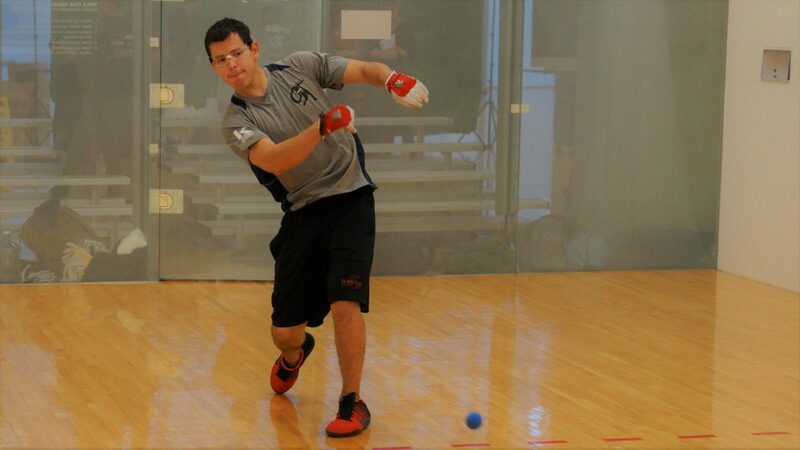 Moreno continued to dominate in game two, cruising into his second final of the R48 6 season. 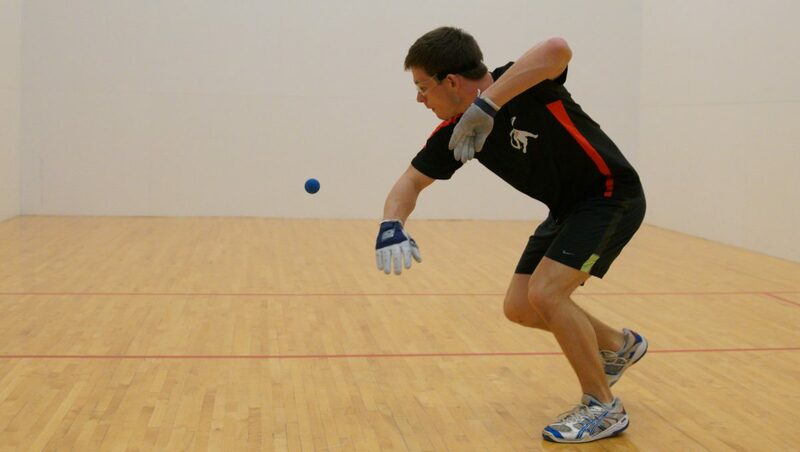 Killian Carroll was ruthless and clinical in defeating one-armed Sean Lenning, peppering balls to Lenning’s backhand and following the weak backhand returns with power passes and kills. 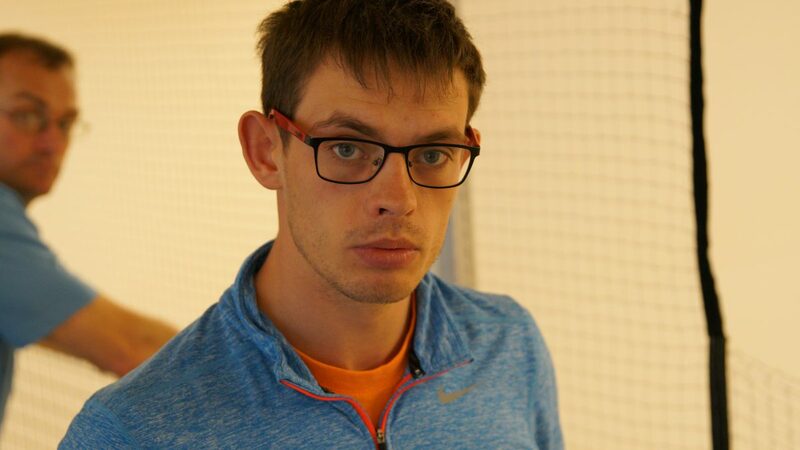 Lenning never threatened, as Carroll marched into the final. “Tomorrow’s final is very important to me because if I win I will become the Race 4 Eight #1 and that is really my goal,” stated Carroll. 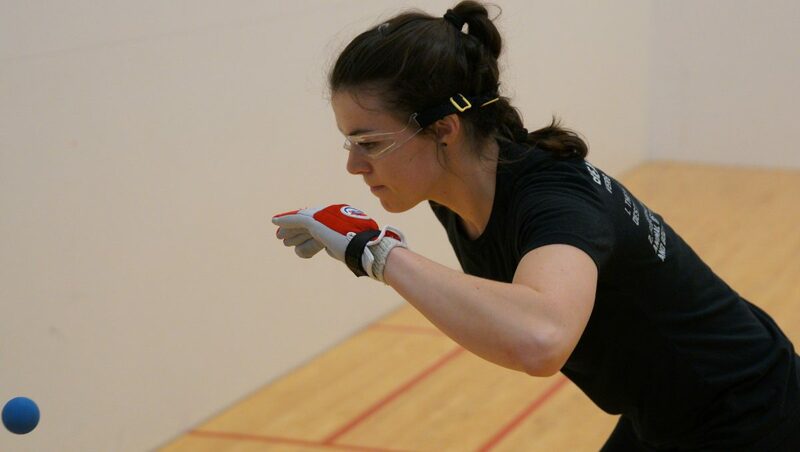 Current USHA 3-Wall national champion Hilary Rushe challenged 2017 WPH Women’s Pro Plummer Bash semifinalist Aimee Ulbert in a special women’s pro exhibition at Houston’s R46 Stop #6. 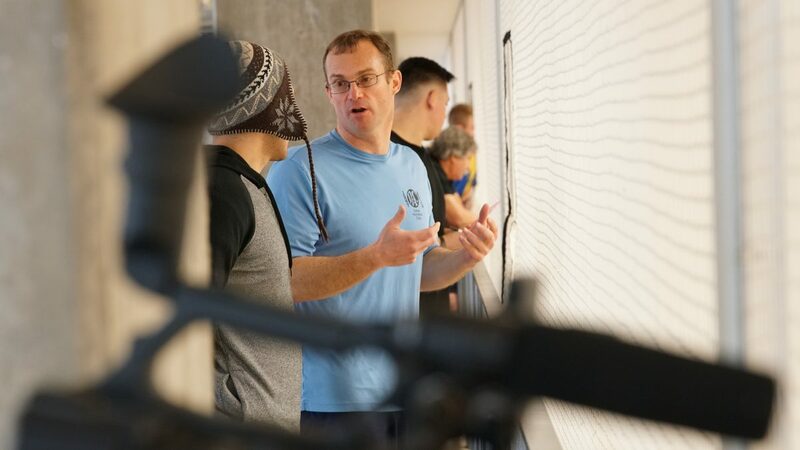 Rushe and Ulbert met for the second time and staged an impressive exhibition. Rushe took game one after nine lead changes, but didn’t have the energy to sustain her high level of play against the super-fit Ulbert. Ulbert ran away with games two and three, announcing herself as a future Wr48 star. 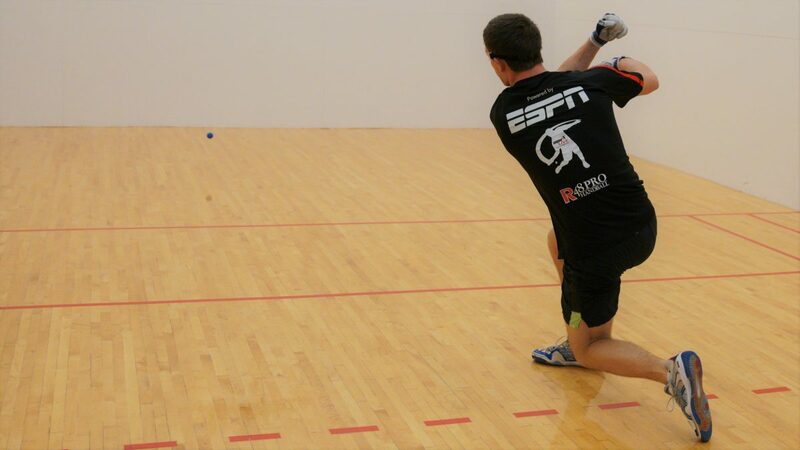 Watch Sunday’s matches from Houston live on the ESPN App starting at 10 am central time (here), as the WPH continues its electrifying handball coverage for the third consecutive season on the Worldwide Leader in Sports. Houston’s qualifier featured the best qualifier thus far in 2017, with nine top 25 R48 pros and a crop of talented hopefuls. Former Elite 8 star and the youngest player to ever finish the season inside the Elite 8, Luis Cordova, faced the R48’s youngest ranked player Michael Gaulton. Gaulton led at the half before Cordova slammed the door in the second half with 11 straight points to qualify for the 18th time. 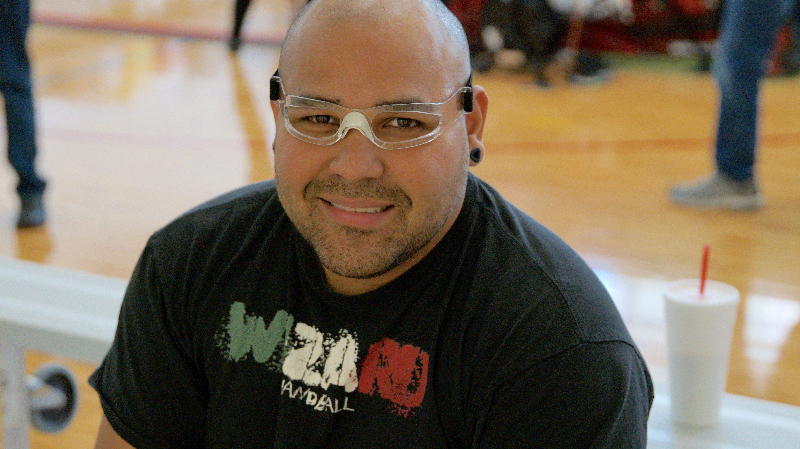 Second-seeded qualifier Jonathan Iglesias had little difficulty in overcoming Chicago’s Carlos Lemus, while 40-something ageless wonder Marcos Chavez continued his mastery against players 20 years his junior, cruising past local favorite Jose Cevallos. 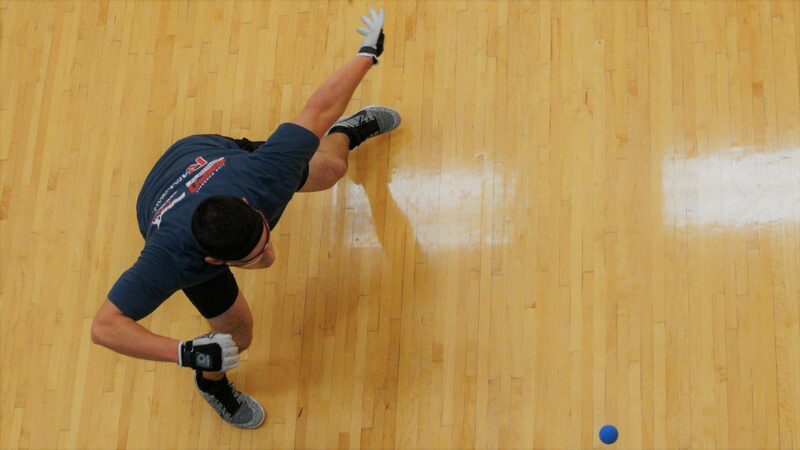 R48 6 “Comeback Player of the Year” Andy Nett faced former junior prodigy Marco Lemus in a battle of two of the biggest hitters in the sport. 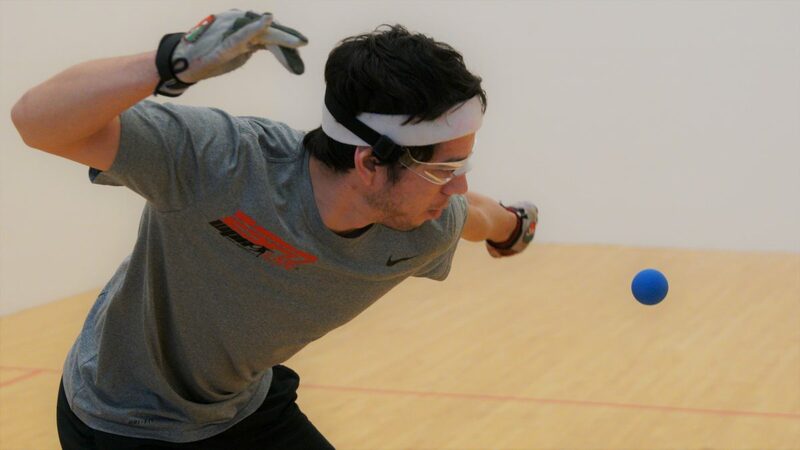 Nett relied on his serve and speed to squash Lemus’ upset bid, advancing to the round of 16 for the third consecutive event. Loren Collado battled back from 9-16 and 21-18 deficits to defeat Canada’s Ryan Bowler in a 75-minute war. 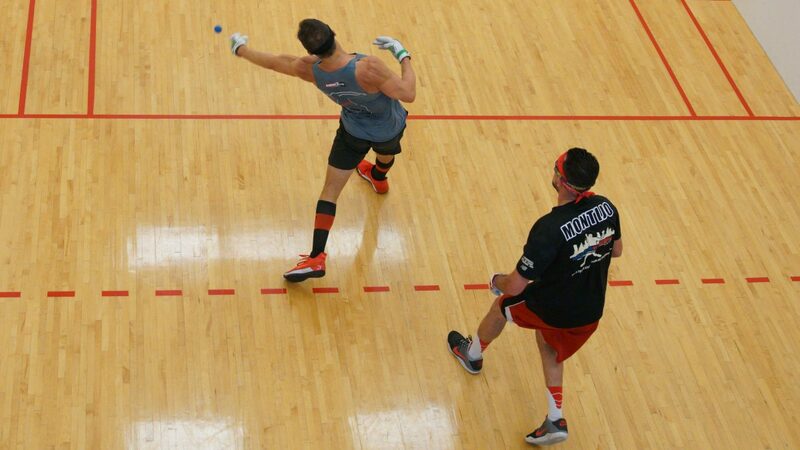 Abe Montijo exacted revenge from his WPH 3WallBall Royal Flush loss against John Wayne Cortez to qualify, pulling away from #TrueGrit in the second half. 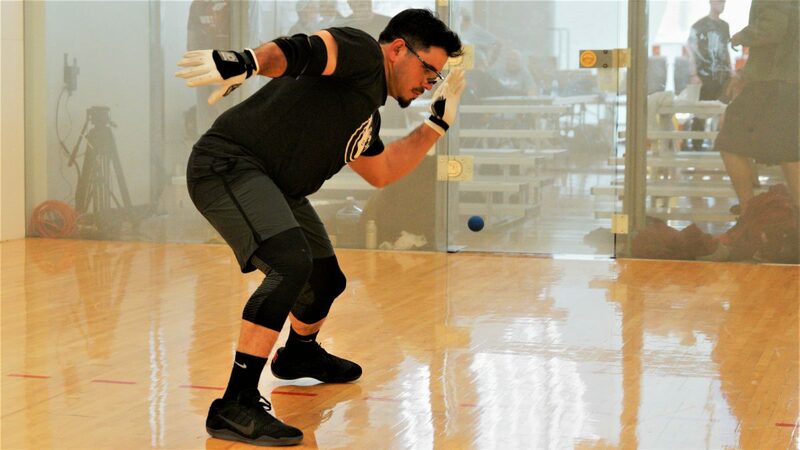 Tucson transplant Shorty Ruiz defeated local favorite Memo Pallares, using his hybrid indoor/outdoor game to cruise past the Texan. Houston’s Blind Draw featured an “Elite 8 Choice,” meaning the Elite 8 pros picked a number out of a hand to determine the order in which they selected their opponent. When the Elite 8 pro chose, he could choose any of the eight qualifiers still on the board that the Elite 8 pro had not yet faced in the round of 16 this season. 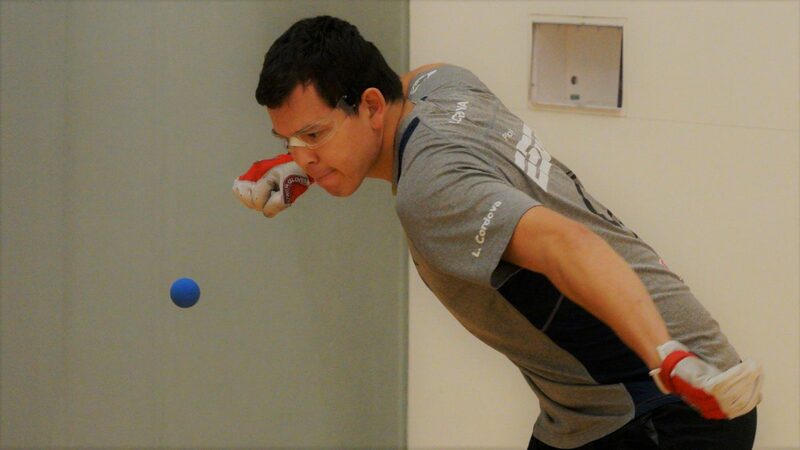 Mando Ortiz became the first R48 #1 seed to lose a completed round of 16 match against LAAC teammate Marcos Chavez. Chavez needed five service innings to win game one in overtime, dropped game two in just nine minutes, and rallied to take a 13-3 lead in the tiebreaker and ultimately closing out the R48 #1 15-10. Third-seeded R48 star and three time R48 6 finalist David Fink cruised past fellow Tucsonan Abe Montijo, while Tucson’s Luis Moreno overwhelmed the Olympic Club’s Loren Collado in two games. 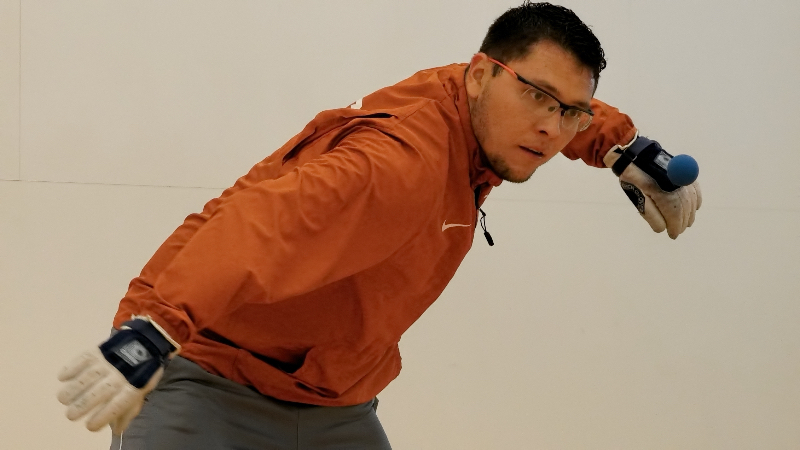 Daniel Cordova rebounded from a first-game loss to outscore Andy Nett 30-5 in the next two games, advancing to his fourth quarterfinal of the season. After consecutive round of 16 losses, Luis Cordova dominated newly minted Elite 8’er Vic Perez in two lopsided games. Sean Lenning entered Houston with a separated AC joint in his left shoulder but soldiered into “Space City” playing with just one hand. Lenning upped his aggressiveness with one hand, hitting aces and rolling out shots from every spot on the floor with his right. Lenning dominated game one but was forced to a tiebreaker by inspired Iglesias play in game two. 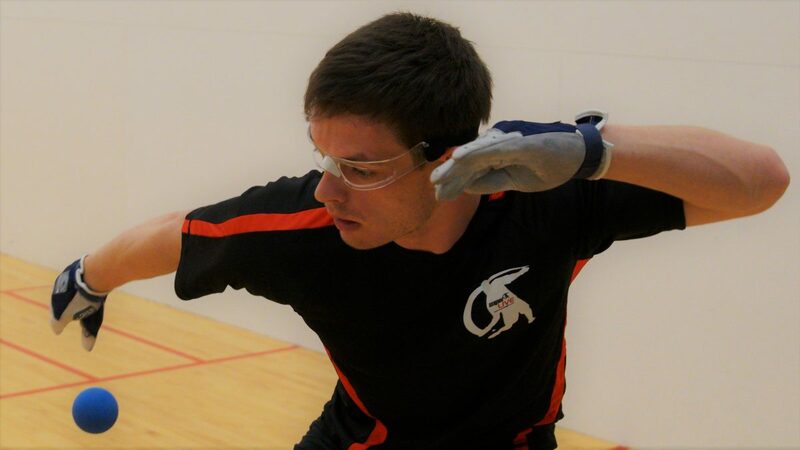 Lenning rediscovered his sensational form in the tiebreaker, never allowing Iglesias into the game and running away with the match. Former Boston sparring partners Emmett Peixoto and Adam Bernhard played the longest match of the round of 16, with “Bernie” holding a game point at 14-13 after 47 minutes of play. Peixoto stayed alive with two spectacular retrieves and clutch kills to take game one and scored the final five points of the match after being tied at 10 in game two. Killian Carroll continued the impressive play that has seen him take third and first in his only R48 6 starts of the season, defeating a very game Shorty Ruiz in two exciting games. 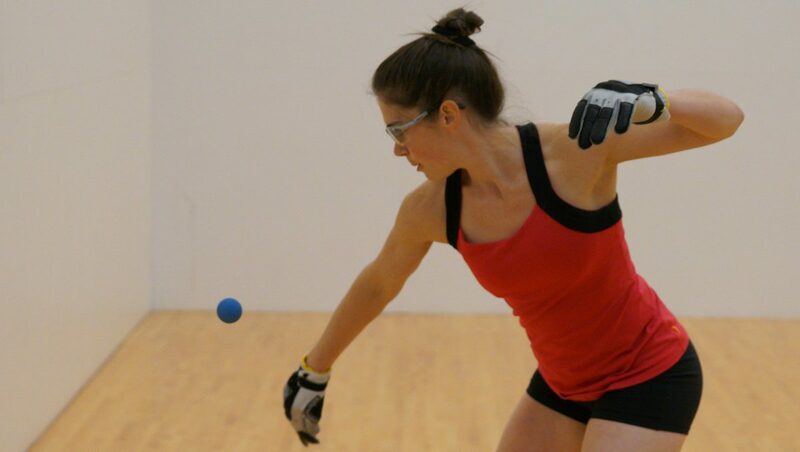 Watch Saturday’s matches from Houston live on the ESPN App starting at 10 am central time (here) as the WPH continues its electrifying handball coverage for the third consecutive season on the Worldwide Leader in Sports.